All applicants to the full-time MBA program at Ole Miss must provide an official transcript of undergraduate work showing a minimum 3.0 GPA for the final 60 semesters hours of academic work; an official GMAT score report (the school lists 550 as the cut-off for "acceptable" scores); two letters of recommendation; and a 400-word personal statement o...All applicants to the full-time MBA program at Ole Miss must provide an official transcript of undergraduate work showing a minimum 3.0 GPA for the final 60 semesters hours of academic work; an official GMAT score report (the school lists 550 as the cut-off for "acceptable" scores); two letters of recommendation; and a 400-word personal statement of purpose. Students who have not completed prerequisite course work in undergraduate business disciplines will be required to complete such courses successfully before commencing work on their graduate degrees. International students must meet all of the above requirements and submit TOEFL scores (minimum acceptable score is 600). Applicants to the professional MBA program "with two or more years of post-baccalaureate degree professional work experience" receive "particular consideration" from the Admissions Committee. The professional MBA program is "very competitive." Ole Miss MBAs receive career support from the university’s Career Center. Students report that many of the best career opportunities come via the alumni network, which is “very supportive. The Ole Miss ‘brand’ is well-respected in the Southeast.” Employers that recruit on the Ole Miss campus include Axciom, Allstate, Bancorp South, FedEx, Harrah’s, IBM, International Paper, Regions Bank, and the Tennessee Valley Authority. 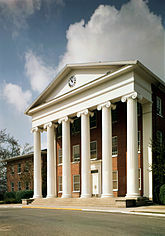 Want more info about University of Mississippi School of Business Administration Distance MBA? Get free advice from education experts and Noodle community members.